Currently, there's talk in the media again about the so-called "Supermoon." What is it? The Moon's orbit around the Earth is not circular, it is elliptic, and the orbit's closest point, the perigee, to Earth is about 50.000 km closer than the farthest point, the apogee. Every so often, full moon on Earth coincides with the time the Moon is at its perigee, and therefore it appears to be unusually large. When this happens, it is called "Supermoon." 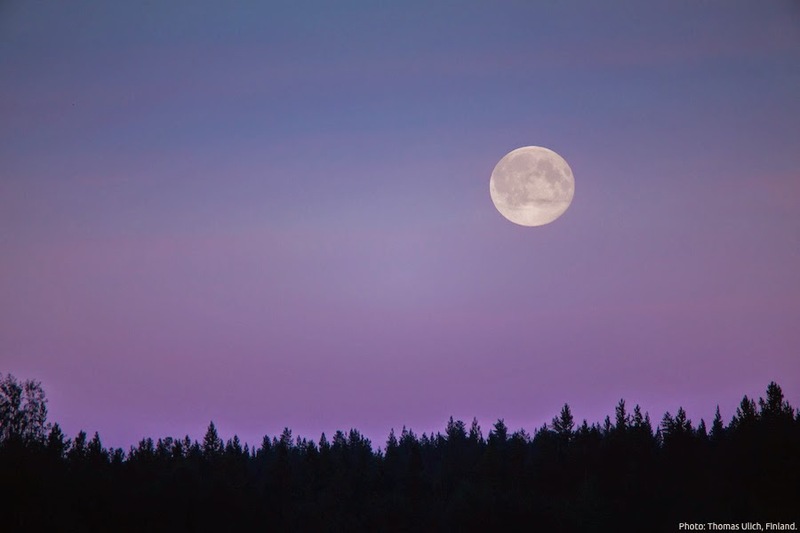 The full moon of 10th August 2014 was a Supermoon, and so was 13th July 2014 (photo above). Also the next full moon will be a Supermoon on 8th September 2014. After that it happens again in 29th August, 28th September, and 27th October 2015 (Supermoon calendar). See also: on spaceweather.com, there's a side-by-side comparison of the size of the moon as seen from Earth in March and August 2014. During our trip to Kilpisjärvi in late June, our group climbed maybe a kilometre up on the track to Pikku Malla, from where one has a great view at the KAIRA facility on the other side of the lake. I used the iPhone 5's panorama mode to take the photo above. We used another camera (on the tripod) to take high-resolution "aerial" photos of KAIRA. 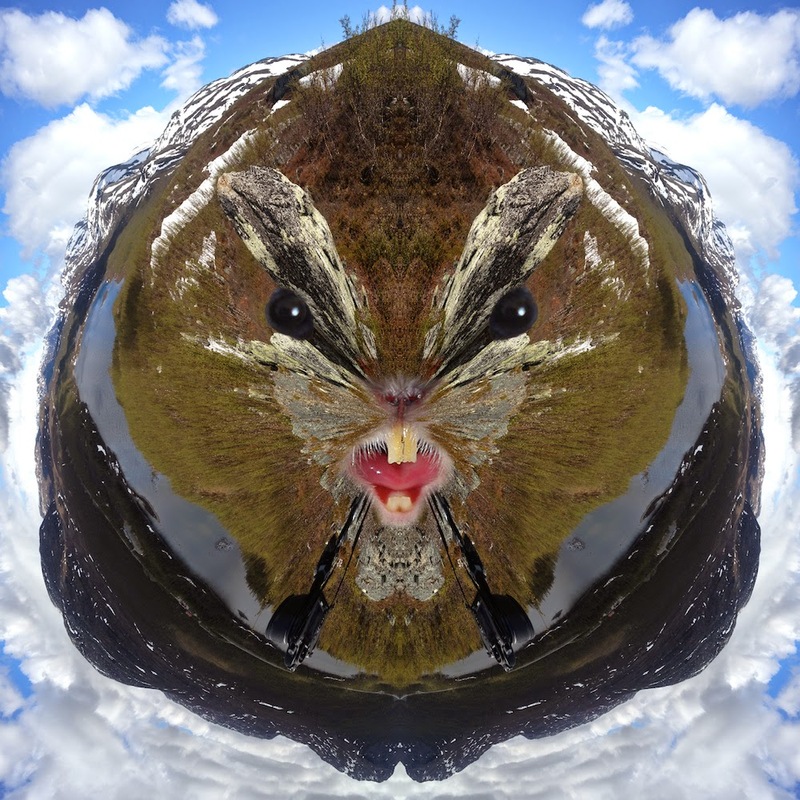 The Killer Lemming of Kilpisjärvi was born – of course – in Gimp. Have fun! Photo and editing: Thomas Ulich. 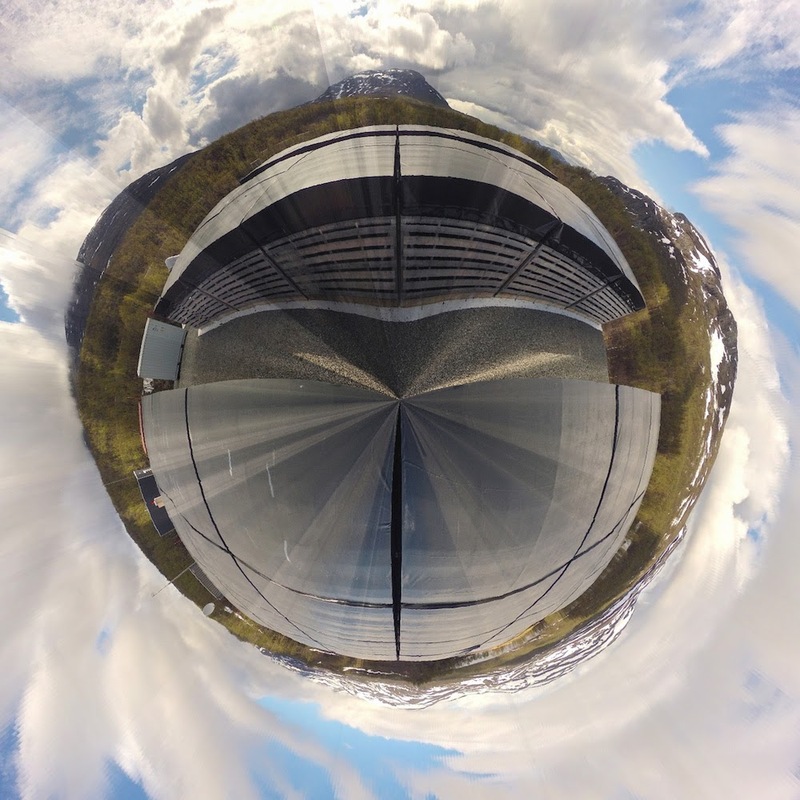 Previously, I wrote about how a time-lapse camera on a rotating egg timer can lead to a pan-lapse film and a stripy 360° panorama. However, one can push this game even further. The above image type is also know as "little planet," since there's sky all around a landscape photograph. It is essential to make the left and right edges of a panorama match exactly to get the impression of a continuous image. The above image was created from the "cloudy sky" stripy panorama of KAIRA. 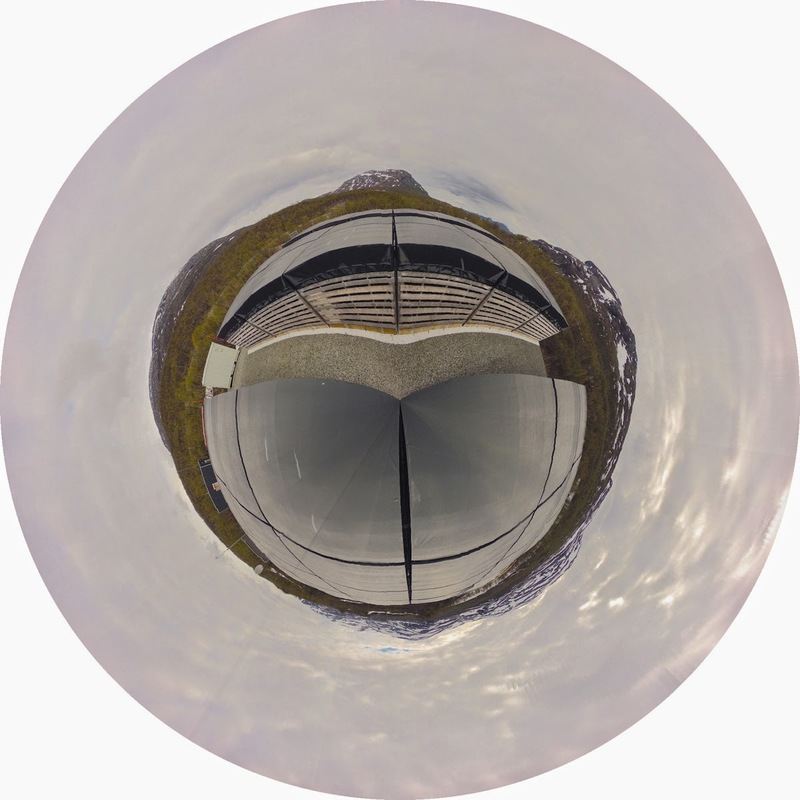 The image was loaded into the open-source image manipulation software Gimp, and then turned into this circular panorama using the distortion filter "polar co-ordinates." It's a pretty cool effect. Of course one can crop it just so as to get rid of the white corners. Alternatively there's another distortion filter "lens correction," which can instead stretch the sky into the corners, but it leads to some artefacts I didn't like, so I opted for cropping instead. Here's the result of the same operation on the "sunny" stripy panorama of KAIRA. Since the centre of both panoramas point in different direction, I used an additional feature of Gimp's polar co-ordinate filter, which let's me rotate the circular image just the way I want it, i.e. with the fell of Saana at the top. Here you can see very clearly the different shades caused by the automatic exposure of the GoPro camera. Photos and editing: Thomas Ulich. A related article is on the KAIRA blog. 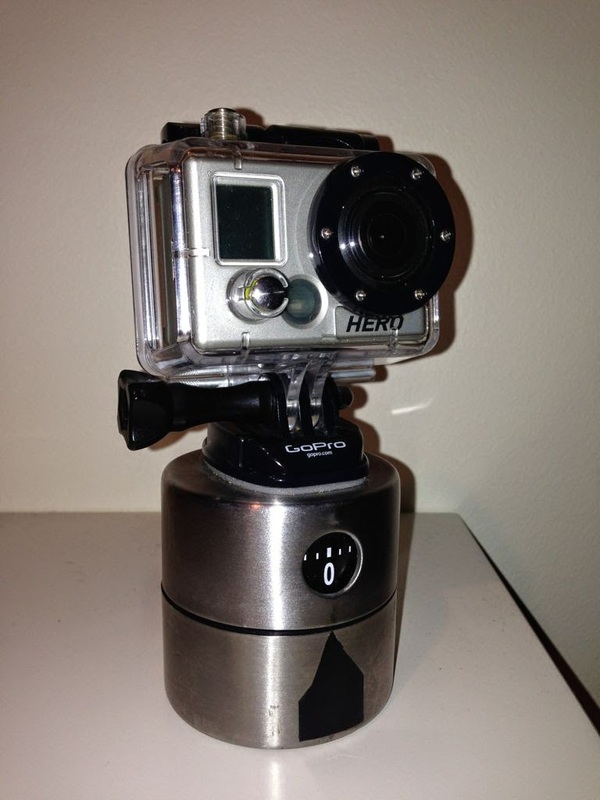 Previously, I wrote about how to make a 360° panoramic time-lapse film using an egg timer. For the photo above, I didn't want to go with twelve 30° views, but instead combine all 360 images into one panorama. This meant to cut from every photo a tiny narrow centre slice (only 22 pixel wide in fact), which is equivalent to one degree field-of-view. These were then all combined into one large image. If you look carefully, you can make out the stripes. On the next day, the weather was much nicer, and I repeated the egg-timer photography. However, due to the GoPro camera's fully automagic exposure settings, and the high variability in lighting caused by fast moving clouds and the bright Sun, it was not possible to make a nice pan-lapse out of these photos, and as you can see, the stripiness is much more pronounced in this image, even though the blue sky is very nice of course. By the way, the strange black boxes in these photos are part of the Kilpisjärvi Atmospheric Imaging Receiver Array (KAIRA). The mountain directly under the Sun in the second photo is famous Saana. In due time I will write about how these were done in detail, in case you want to try yourself. You can click on the above images to get larger versions. 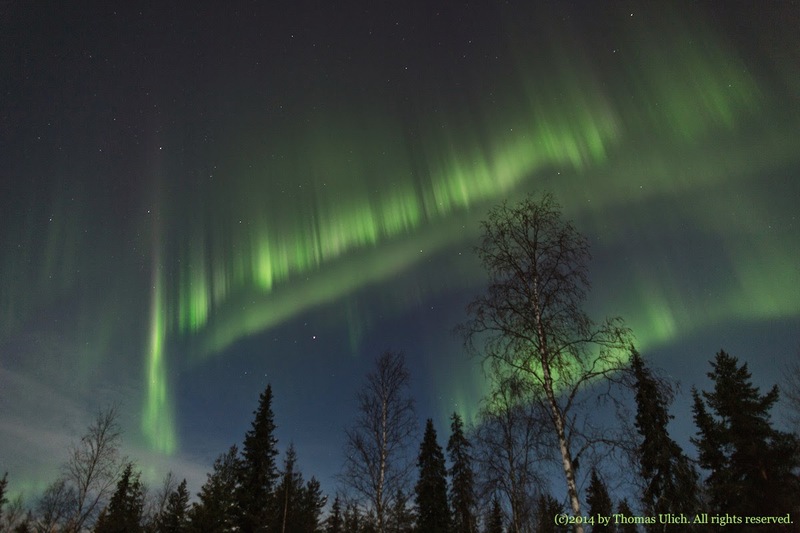 Original photos and panoramas: Thomas Ulich. Another article about this you can find on the KAIRA blog. 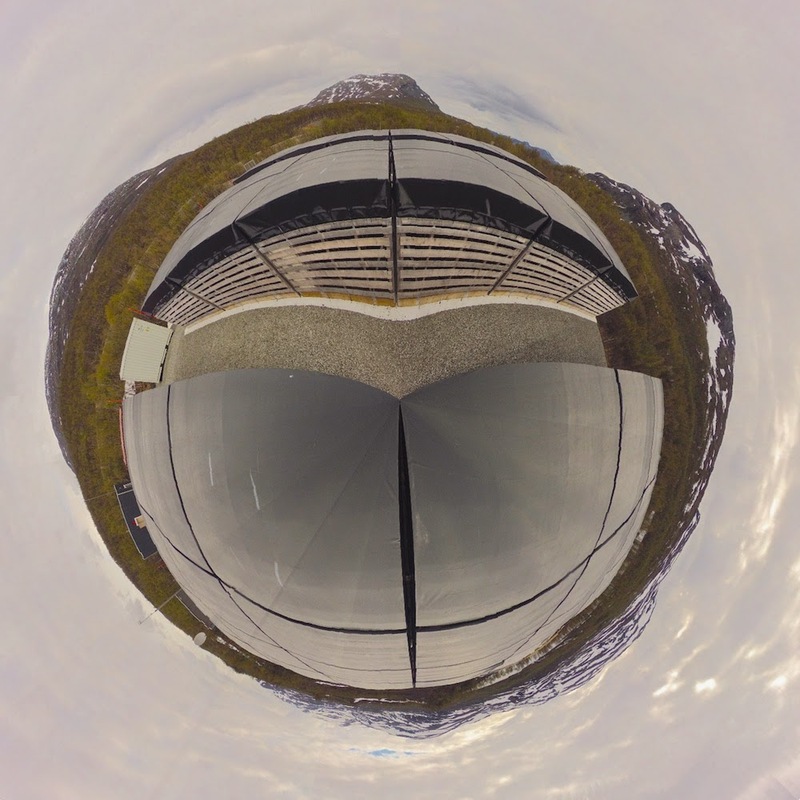 In late June, I went to Kilpisjärvi on a service mission to Finland's largest radio telescope, the Kilpisjärvi Atmospheric Imaging Receiver Array (KAIRA), which was built there by our institute, the Sodankylä Geophysical Observatory. The first thing I did upon arrival, was to place a GoPro time-lapse camera on an egg timer, in order to make a full 360° panoramic time-lapse film (YouTube). The GoPro cameras (Hero 2 above) have excellent optics for what they are, since they have a fixed focal length (no zoom) and also have fixed focus. Thus the extreme wide-angle lens needs to do only one thing and is optimised for that. Also, the GoPros have a built in time-lapse mode, i.e. they can take 11MP or 5MP images at a number of set intervals between half a second and one minute. The cheapest way to make rotating time-lapse films is to mount the camera on a cheap (about 4€ or so) IKEA egg timer. The timers do a full 360° rotation in one hour, which is a good duration for a time-lapse. The only negative point is that they can only rotate in one direction (unless turned upside down). For the film above, I programmed the camera to take a photo every 10 seconds, and set the timer to 60 minutes. Thus the camera was set to take one image per one degree of rotation. Rather arbitrarily, I decided then to use these images to stitch them together to 360° panoramas by using twelve 30° sections. These sections are indicated by the grey lines in the image at the top. Thus I needed to take every 30th image and see how much they overlap, and cut away the overlapping parts in order to have only the 30° centre sections. Then I stitched the 12 images together, 30 images apart, leading to a 360° view. Now, since the camera took a photo for every degree of rotation, I made 360 different panoramas, each shifted by one degree with respected to the previous. These were then combined into a full panoramic time-lapse film, also called a pan-lapse film. If you look carefully when watching the film (e.g. look at the clouds), you will see that the same bit of film repeats in every pane and migrates from left to right through all panes. In other words, every pane is a 30-image time-lapse film, repeated through all twelve panes, and thereby making up a film of 360 frames. The film looks really nice when put on loop, but this is unfortunately not possible on YouTube. There are a few other games one can play with this set of images, so watch this space! By the way, I got the idea of pan-lapse films from Ken Murphy of Murphlab, please visit his site for this and other exciting time-lapse projects. Photos and time-lapse film: Thomas Ulich. Another blog post was published about this on the KAIRA blog today. 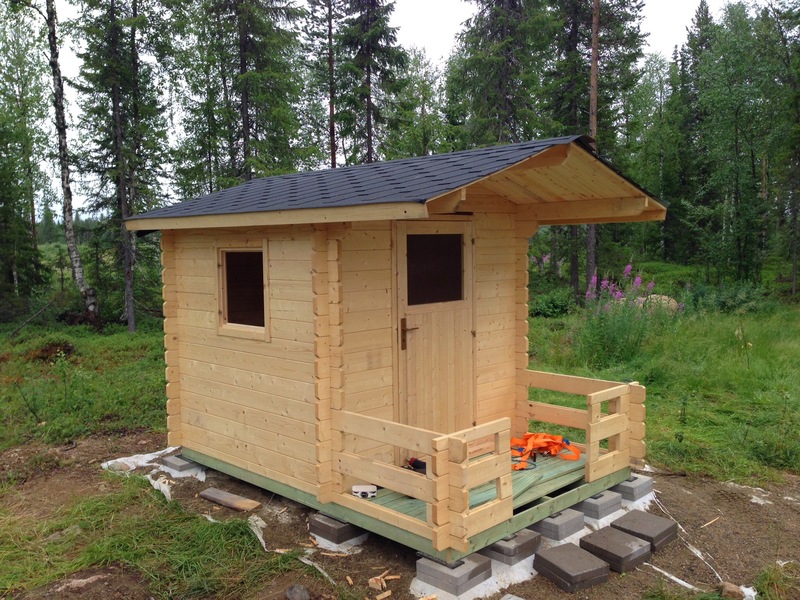 Finally the felt is installed on the roof and the play house starts to look complete. The edges of the felt in front and back need trimming, and some more planks need attaching, but it's getting there now. The final job will be painting. The felt came in precisely precut sheets of a metre in length. They are installed in such a way, that they overlap to give the impression of tiles. They are nailed to the roof underneath, and the nails must be placed where they will be covered up by the next layer. The work always goes from the outer edge of the roof up to the summit, so that water cannot penetrate between the layers. The material has a plastic sheet at the back, which must be peeled off first, and then the sheet will stick to the under underneath. The heat of the Sun makes the melt together, or then one can use a heat gun to speed things up when rain is approaching — like tonight. This is what the house looks like now. Besides the roof, the floor boards of the terrace need some fine tuning at the entrance, and the railing around the terrace will get a flat top. Then we'll be done. Today our play house got its floor and roof. First we jacked up the three inner foundation beams to make sure they are level. A little padding and all is good. 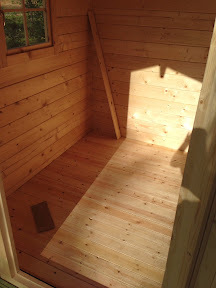 Then we installed the floor of the terrace, and then the floor inside (photos above and below, respectively). In order to allow the wooden structure to move a bit over time, gaps must be left between the panels of 1-1.5 mm and 5 mm around the edges. The gaps between the floor boards of the terrace are about a centimetre wide. This gave us good ground for a ladder in order to put the roof panelling in place. Starting from front to back, and one side at a time, the panels were installed — again making sure that there's a 1-1.5 mm gap between the individual panels. 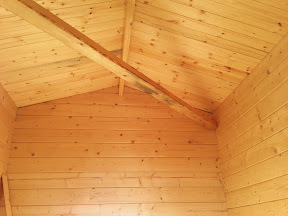 What about the diagonal beam under the roof? As explained in yesterday's blog post despite all care, the whole structure was skewed and while both diagonals at the bottom were as precisely the same as can be (to 1 mm), at the top the diagonals differed by some 2 cm! This was fixed by putting the beam in place after cutting it to exactly the correct length of the diagonal. 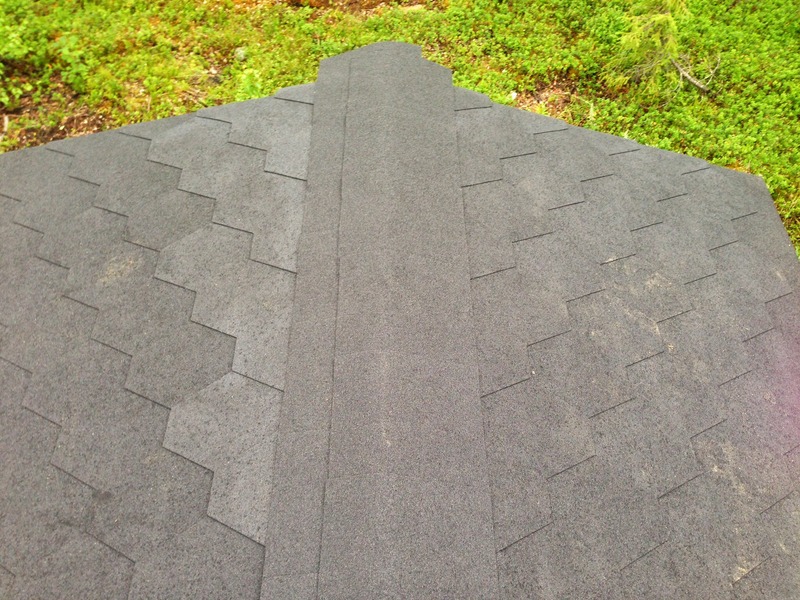 Once installed, both diagonals matched also at the top. Now that everything is in place and the roof is on, the tension's gone elsewhere and the diagonal beam is lying loose without any pressure on it, secured by a few nails. This is what it looks like now, after completion of this stage. 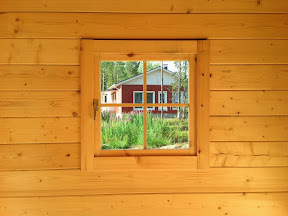 Finally a photo of Our House as seen from inside the play house. 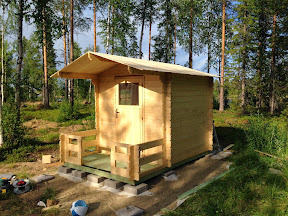 Tomorrow we plan to continue with putting the bitumen tiles on the roof and possibly giving the play house a first coat of primer paint in order to protect it from the elements. By the way, the play house is a kit marketed as "Lillevilla 209" or "Lillevilla Playhouse 4", a product from Finland, which is available elsewhere in Europe, too. 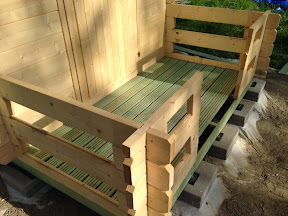 Finally, the play house project is taking shape. 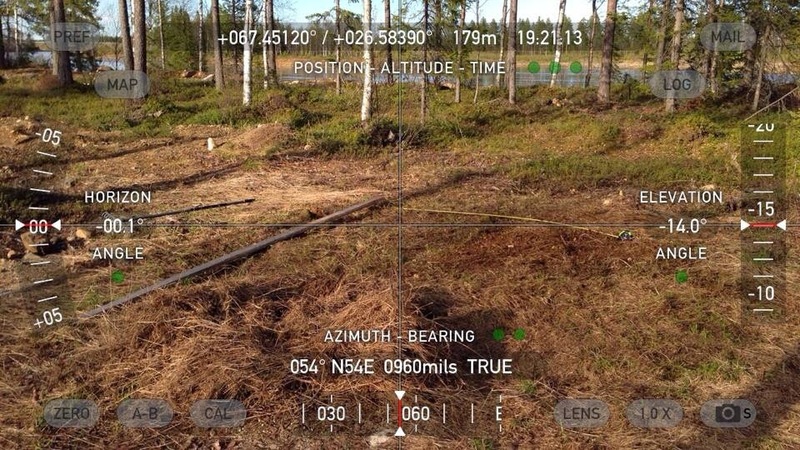 We bought a kit in late May, and began by surveying the location. We used concrete tiles as foundations, and it is very important to get all tiles exactly to the correct height, or otherwise the log construction will be skewed. We also put down a large sheet of geotextile to prevent vegetation from growing under the house. The next step was to put down five foundation beams of wood, and the first layer of logs on top of that. Here, again, it is very important to have everything level, and to be absolutely sure that both diagonals are of the same length, or otherwise the house will not have right angles and things like window and door won't fit properly. So it takes ages to do all the preparations, but after that it's great fun to see the house grow — a process that we have filmed with our GoPro Hero 2 camera at one image per 5 seconds. Have a look at the resulting time-lapse film, which is just over a minute long. Enjoy! The final photo above shows what it looks like now. 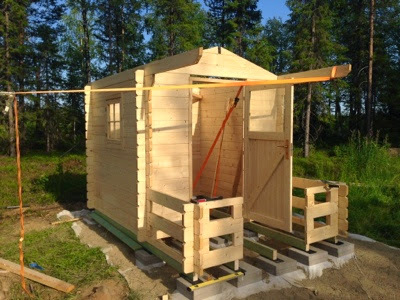 The cargo lashings inside are needed, because despite all accuracy with getting everything aligned just right, wood is a natural material and everything was slightly off direction and needed careful nudging into the right place. 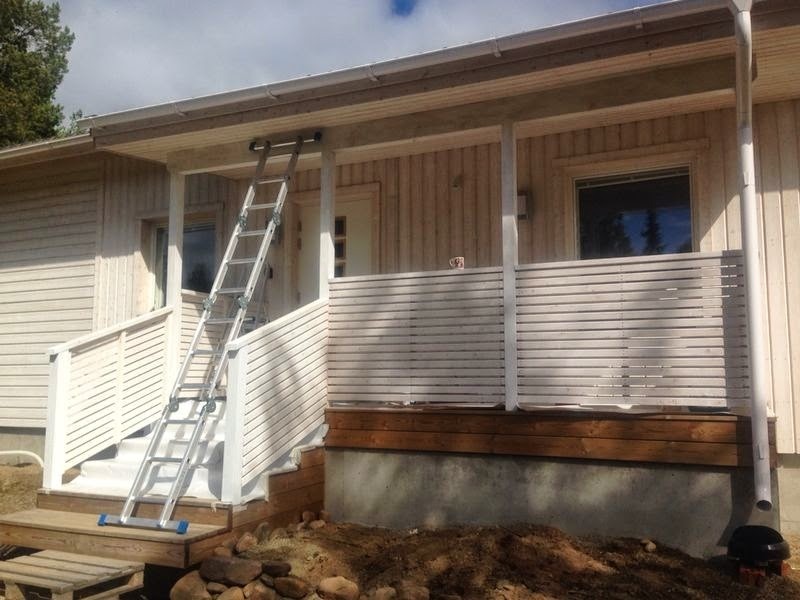 This summer we have finally began to paint Our House. The weather this summer has been very variable, and bad weather and weekends seem to be highly correlated. Thus the progress is slow, but it's still looking good after only three days on the job. On Day 68, the vertical columns and the horizontal beam under the roof were primed, and parts of the railing got their first coat of paint. Almost at the end of Day 69, large parts of the western face of the house had received the first coat of red paint. Finally the final look became apparent: the classic combination of dark red paint for the walls, and white for the window frames. 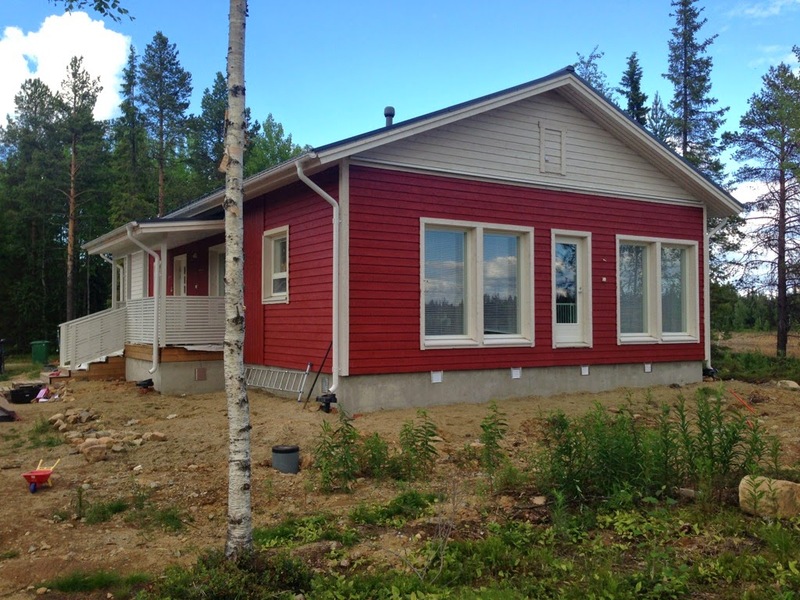 The factory name of the colour scheme we chose for our house reflects just how traditional these colours are: "Mummola" ("granny's house"). 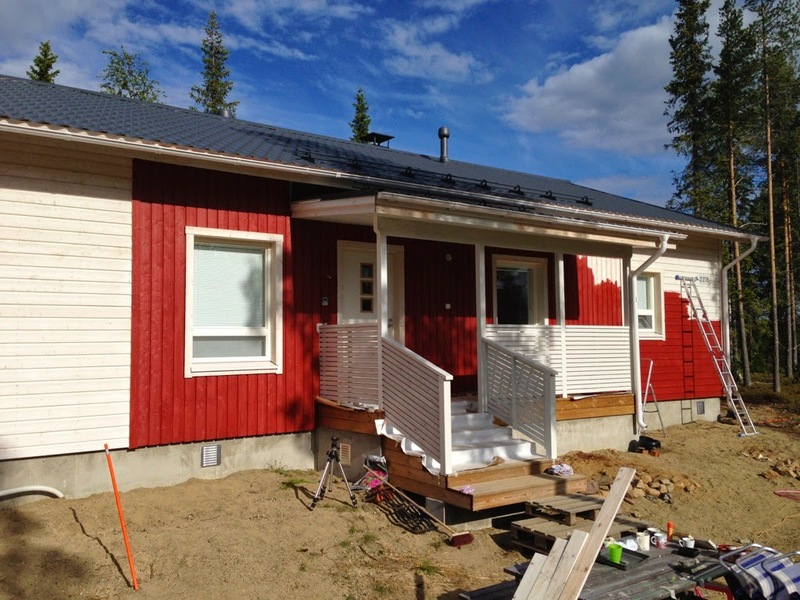 The colours are Tikkurila 526X (red) and 603X (white). 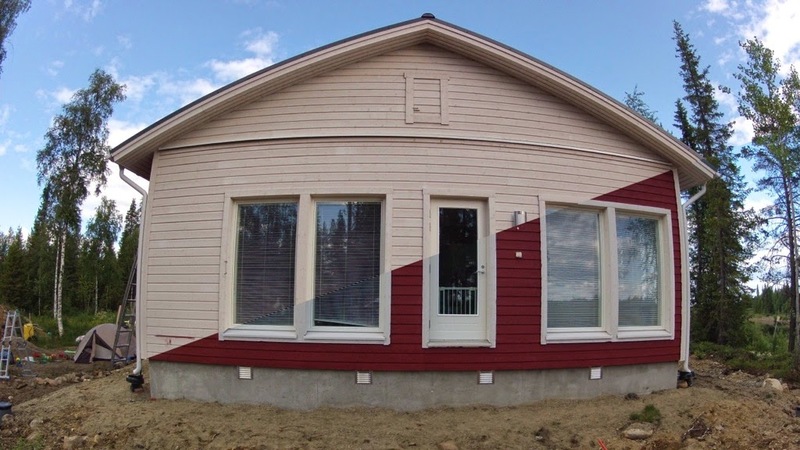 Today (Day 70), we painted the lower part of the south face of the house, which turned out to be a somewhat tedious job, since there are three narrow sections with horizontal panels between windows, door, and at the corner. We had a GoPro Hero 2 taking photos every 10 seconds during painting and made a short time-lapse film of it. The above image is a composite of the first and last images of the time-lapse sequence. Finally, here's a photo of what it looks like now while writing this blog post. The gable as well as all wooden panels under the roof overhangs will have to wait until we have rented a cherry picker in order to work safely and efficiently.